Peterborough embodies all that is good about Ontario – a busy and friendly city of many communities located amidst outstanding natural scenery on the Otonabee River in the beautiful Kawartha Lakes region with so many outdoor activities to do all year round. The city and surrounding communities also enjoy the services of VMedia – the celebrated and highly innovative Multimedia Company providing top quality High-Speed Internet, IPTV, and Phone services from it’s Toronto HQ since its foundation in 2013. VMedia continues to develop and expand in Ontario and other regions with a vision to be in every home in Canada in the future going forward. In this exciting digital age having a modern and reliable Multimedia services is a must and VMedia continue to invest millions of dollars in the latest technology, innovation and infrastructure across Canada to provide the best services at affordable prices with amazing choices and flexibility that has made us the most number one choice for our satisfied customers today. Peterborough has a long and interesting history from First Nations Communities to the present day reflected in the local historical sites, museums, galleries and the lovely architecture in and around the city. There are many parks, trails like the Rotary Greenway Trail and The Jackson Creek Kiwanis Trail, gardens and the Riverview Park Zoo to visit with a lively downtown boasting many shops, restaurants, cafes and so much more to see and do! In a world that is constantly online having fast and reliable internet is a necessity economically and socially and VMedia is proud to be associated with the city of Peterborough empowering customers there with an internet service of super-fast speeds with no limits, no contracts really affordable prices to suit every household and budget. VMedia are the ISP Provider that is constantly improving and upgrading its network to offer that little something extra to its customers. We offer a wide variety of Internet plans and Internet Deals to suit everyone’s needs, usage, budget and location, and in the Ontario region we are currently offering DSL or Cable Plans – all at amazingly low prices and our Sales team will assess and advise based on your location and needs, then match it with our low prices – guaranteed! VMedia employ a highly skilled Technical Support Team who are available seven days a week to ensure a seamless and reliable service to keep everyone connected, informed and entertained every day – That’s a promise from VMedia! Click here to see all Internet Plans and our really cheap internet prices! VMedia have recently launched their new nationwide monitored wireless home security system called VMedia Protect offering a new and easy to install a security system for your home that will be a deterrent to unwanted intruders and giving 24/7 protection guaranteed. VMedia Protect is designed and manufactured to the highest standards at really affordable prices and when installed will your home will be monitored by our 5 diamond and ULC certified Central Monitoring Station 365 days a year giving you complete peace of mind when you are away from home. VMedia Protect also comes with a free app for constant updates and information and can be used to remotely arm or disarm your security System anytime – all this with no contracts and full 30-day money – back guarantee. The VMedia Protect Kit contains all you need to protect your house, apartment or condo and so easy to install (DIY). The Kit contains the Security Hub (main control Panel) x 1, Door /window sensors x 2, PIR motion sensor ( monitors your homes internal area and is completely pet – friendly !) and window decals (informing unwanted visitors that your property is protected and monitored 24/7 by VMedia Protect) x 4. Extra sensors and other items are also available – contact our Sales Team. The Security Hub is the main control Panel for your home security system and comes ready to use – all that is required is an internet connection. The sensors and PIR motion sensor connect wirelessly via RF and will send a signal instantly to our Central Monitoring Station if an alarm is triggered. The Hub has a built-in battery to cover power outages. Simply plug in the Hub, attach the sensors and call us to activate! VMedia Protect will manage your home security with our expert home monitoring provided by our team at the Central Monitoring Station 24/7 and 365 days a year. VMedia Protect offers 2 great plans called Protect and Protect Plus. Protect offers complete 24/7 professional monitoring 365 days a year and will give instant updates and communication via the internet with text, email and push notifications. We can also remotely arm/disarm your Security Hub if required. Cost of Protect is only $12.95/month. Protect Plus offers complete 24/7 professional monitoring 365 days a year and will give the instant updates by dual communication via the internet and cellular with text, email and push notifications. We can also remotely arm/disarm your Security Hub if required. Cost of Protect Plus is only $16.95/month. VMedia Protect offers our customers in Peterborough and the surrounding area a unique service called Private Security Response – if your home alarm is triggered we will send a member of our Private Security Response Team to visit your property and assess for any signs of a break in and if one is detected will immediately notify you and the local police. This avoids costly false alarm call out charges of $75 -$150 depending on your location. This great service costs only $4.95/month! Extra sensors and other items including PIR motion sensors, Key Fobs, GSM upgrades, and a Pin Pad may be added and placed at entrance/exit points of your home and allowing you to arm /disarm your Security Hub using a private code. Contact our friendly Sales Team for all the information and advice about home security and VMedia Protect. Click here for the list of accessories and all prices. Once you VMedia Protect Kit is installed we will issue an Insurance certificate for your home Insurance provider allowing a reduction in monthly premium of 11% -15%. – more savings for you! VMedia Protect – peace of mind 24/7. IPTV is the future of Television viewing and entertainment all over Canada and in this Digital Age we live in today thanks to advancements in Technology and the worldwide availability of the Internet. IPTV is seen as the alternative to the traditional satellite and cable options and VMedia have successfully operated its IPTV service in Ontario since 2013, bringing extraordinary entertainment experiences to its customers since then and becoming one of the most popular IPTV Companies in Canada today, and we continue to offer the people of Peterborough and the surrounding communities this unique and amazing IPTV service with significant flexible choices and really low prices too! 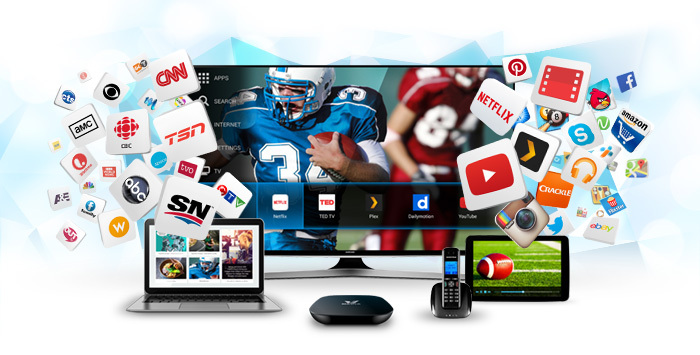 IPTV is streamed via the internet through an IPTV box called The VBox, bringing a huge variety of top Canadian, the US and international networks and channels, news, sport, films, music, kids, games and much more. The VBox has a built-in the browser allowing instant access to Facebook, Twitter, Skype, YouTube, Netflix, Plex, XBMC, Instagram, Picasa and 100’s of apps bringing a whole new world of information and entertainment to your home every day. VCloud and PVR add to the capabilities of the VBox, allowing recording so you never miss your favorite programmes and PVR to record, rewind, pause, stop or fast forward a recorded programme, adding extra flexibility and enjoyment – only from VMedia IPTV! VMedia offer a range of exceptional Packages and Theme Packs on the IPTV Market today bringing unlimited choices and a wide range of shows and channels for all ages and interests starting with our most popular Package in Canada today called TheSkinny – offering 23 channels for only $21.95/month, The Basic – offering 45 channels for only $33.95/month and the new Premium Flex offering 4 superb options – Premium Classic, Premium Family, Premium Sport and Premium Lifestyle with 2 months free for only $49.95/month, and The Grand Premium – offering 100 channels for only $67.95/month! With UChoose from VMedia, you can pick and choose from over 60 standalone, creating your own personal viewing experience at only $2.95 per channel and the more you buy, the less you pay – incredible value as standard from VMedia! Click here for the list of channels, Packages, Theme Packs, and all prices. Home Phone gives you get low monthly rates, 15 superphone features, no contracts and the first month free. Canada Plan gives you unlimited calls all over Canada and reduced rates elsewhere for only $15.95/month. World Plan gives you unlimited calls to over 60 countries worldwide and reduced calls elsewhere for only $26.95/ month. These plans and prices represent the excellent value always available from VMedia Phone – Canada’s best Phone Provider! Click here to see all Phone Plans, phone features, and all prices. At VMedia our dream is to be operating in every village, town, and city all over Canada in the future going forward and we work hard every day to achieve this. Our aim is to continue expanding our infrastructure, technology and services including our new wireless monitored Home Security system called VMedia Protect and will look forward to working with our customers in Peterborough thanking everyone for supporting us making VMedia the success story that it is today. Why not call our friendly Sales Team today at 1 – 855 – 333 – 8269 or visit www.vmedia.ca to see all our current deals, bundles, current special offers and prices only from – VMedia! VMedia – making the future present!